Description: Pair of Tier II GE units sit at Neptune Street crossing, the lead locomotives for this coal train. Description: The new spring buds on the Oak Trees give an almost fall-like appearance to NS 738 as he clears Tyner, TN. on it's way to Juliette, Ga. Description: This pair of Tier II GE units occupy track in the Harvard Yard, waiting on a work train and a departure signal. Description: A view of the Soco Yard exit rail aongside the stately Evolution locomotive. Description: Coal empties head west with a KCS ACe trailing. 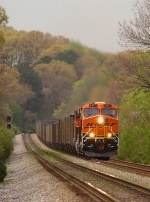 Description: A empty BNSF coal train crawls through the little town of Pottstown, IL along the BNSF Peoria Subdivision. 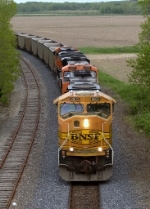 The BNSF Peoria Subdivision runs from Galesburg to Peoria, IL. Description: A empty BNSF coal train climbs the hill into Edwards, IL on the BNSF Peoria Subdivision. Description: CSX K635 and Q380 meet at the diamonds in Ashtabula. Q380 sports a nice BNSF-KCS consist. Description: Things were better when the C-ETMPED showed up. Description: Around 10:00 A.M. on 11-7-10 at MP 41.9 on the BNSF St. Joseph Sub. BNSF XRICCNB7 03 (empty ethanol train) led by BNSF 793 rear ended BNSF XGATNEN903 (empty grain train) which was shoving out of the siding at East Armour, MO apparently after running a red signal. The crew on the BNSF 793 put their train in emergency before plowing into the rear of the grain train. The crew had minor injuries and were treated at the scene and are very lucky. The wreck was around 30 hours prior at this point. Description: BNSF 5097 leads the C-BTMKCH0 12A to Kansas City.